When it comes to gifts we believe that small, carefully considered presents, or homemade gifts are much nicer than generic, off-the-shelf buys or a hastily-bought bouquet of flowers. For something different why not make a colourful posy of paper flowers – with just some tissue paper and some basic craft tools you can make stunning creations that last a lot longer than the real thing. There are numerous online tutorials that talk you through the steps, ranging from simple techniques children can try their hand at to more elaborate creations. 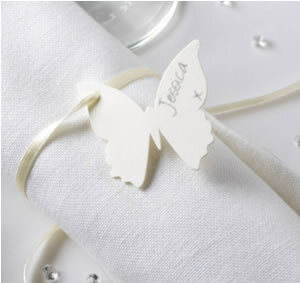 Tie with a length of ribbon and attach one of our chic luggage tags or butterfly tags to your posy to add a decorative finishing touch. 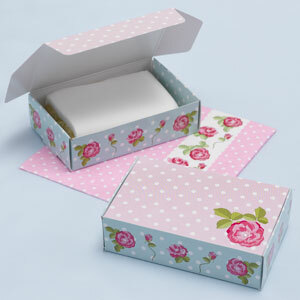 If your mum loves her cuppa, why not treat her to a gorgeous new mug, or a posh china tea-cup to add to her collection? There’s a good choice of mugs perfect for Mother’s Day – some which you can personalise – on Notonthehighstreet.com, or you could create something completely unique with your own mug painting kit, or by booking a session at a local pottery studio. Add in an extra treat with a beautiful slice of handmade cake, or something yummy from a posh patisserie (try Patisserie Valerie, which has branches nationwide), presented in one of our Vintage Rose cake boxes. Throw in a couple of her favourite magazines and you’ve created the coffee break from heaven, and a wonderful excuse for busy mums to put their feet up and enjoy some well-deserved down-time. The standard Mother’s day surprise is lunch out, but with many restaurants hiking up their prices, or becoming fully booked weeks in advance, don’t worry if eating out isn’t an option. If the weather is on your side – and you just never know in the UK; heat waves in March are not unheard of! – you could treat Mum to an early Spring picnic. Find a local beauty spot and load up the hamper with flasks of hot tea and delicious goodies from your local deli or M&S. A homemade cake won’t go amiss, or you could rustle up a batch of cupcakes. 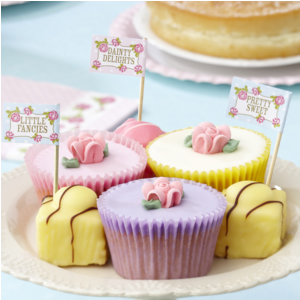 Jazz them up with our gorgeous cake accessories – our Vintage Rose cake sticks and cases are the perfect addition for a special occasion picnic, and co-ordinate with our other picnic must-haves, including paper plates, cups and napkins. And of course no Mother’s Day picnic would be complete without a bottle of bubbly! If you’re looking for another simple craft to try with your children, take a look at the feast of ideas on the Hobby Craft website – there’s a whole section dedicated to Mother’s Day with ideas pitched at both beginners and experienced crafters. We love the Button heart framed picture and the tote bag ideas. If you opt for a simple home-made tote, why not fill it with some cute treats for mum to enjoy; a lucky lottery ticket presented in a Vintage Romance ticket holder, an organza bag filled with foil hearts, a new book, or a gorgeous nail polish or pampering treat….so much more thoughtful and original than a shop-bought gift. This entry was posted in Seasonal and tagged Creative, Happy, Ideas, love, Mothers day, Mum, Original, Special, Vintage Romance, Vintage Rose by Neviti. Bookmark the permalink.